Heat the oven to 375°F. Lightly grease or line 2 baking sheets with parchment paper. Stir the sugar, coffee mix and cinnamon in a small bowl. Sprinkle 1/4 cup sugar mixture onto the work surface. Unfold 1 pastry sheet onto the sugar mixture. Sprinkle with 1/4 cup sugar mixture. Roll the pastry sheet into a 12 x 10-inch rectangle. Sprinkle with 1/3 cup hazelnuts. Gently press the hazelnuts into the pastry with a rolling pin. Cut the pastry into 4 (12 x 2 1/2-inch) strips. Cut each strip into 4 (3-inch) rectangles. Cut each rectangle diagonally in half into 2 triangles, making 32 triangles. Starting at the wide side, roll the triangles up to make a crescent shape. Place the pastries pointed-side down on a baking sheet. Repeat with the remaining pastry sheet, sugar mixture and hazelnuts, making 64 pastries in all. Place the chocolate into a microwave-safe bowl. Microwave on HIGH for about 30 seconds. Stir until the chocolate is melted and smooth. 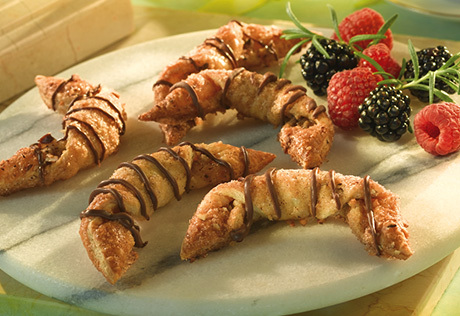 Drizzle the chocolate over the pastries. The pastries can be stored in an airtight container for up to 1 week. Make-Ahead: The pastries can be prepared through Step 3 above, then frozen for up to 3 months. Reheat in a 300°F. oven for about 5 minutes or until the pastries are crisp. Let cool on a wire rack and drizzle with the melted chocolate just before serving.